I know I over extended myself on the cosplay this year. I think I could have managed one really good costume, but not three. I’m afraid that all my cosplay will look unfinished and rushed. Oh well, might as well just keep working at it and everything else, because if you have to be alive one might as well be doing things. 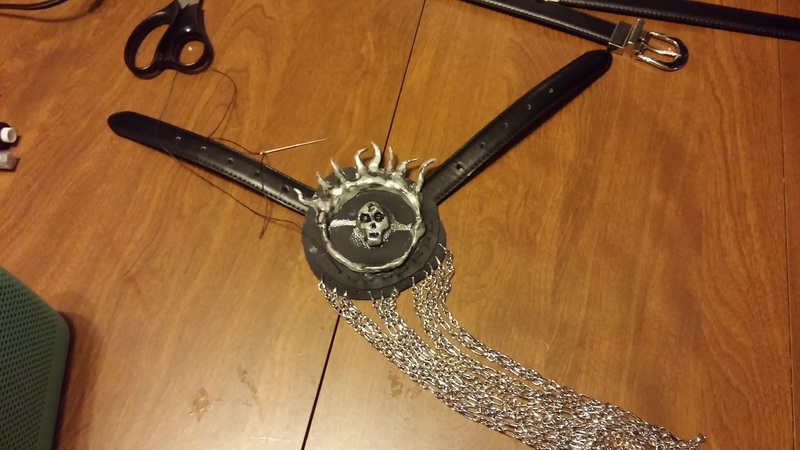 Today I worked on Imperator Furiosa’s crest belt. I haven’t done much leather work, it’s been a hobby I’ve tried to stay away from because it’s costly and I already have enough hobbies. However a little bit of leather working was necessary. Since this piece is supposed to look a bit rough I decided that I might as well give it a try myself instead of asking my leather-working buddies for help. My first step was cutting out a rough circle of black leather and using a rotary punch to make lots of holes along the bottom. After enough holes had been created I started cutting chain to attach. I thought that her belt crest only had one type of chain, but I was wrong. It is mostly silver/chrome colored and off a similar design to what I got a few days ago at the craft store, but there are a few different types thrown in. I had a gold look chain in my supplies, but I would like a few other types. I’ll see what I can find tomorrow. Polymer clay is always not one of my hobbies. Sculpting is something I’ve never had a knack for and to be honest I really sort of hate doing it. I don’t like the feel of the clay against my fingers, I don’t like trying to shape it into the shapes I need. I get easily frustrated working with clay. I did the best I could and I came up with something similar to what Furiosa was wearing, but not very similar. I’m hoping no one looks to close, and also that the flame points don’t break off. But this is a pointless dream, I have never made anything of polymer clay that didn’t break. One must accept impermanence, to do otherwise causes suffering. Some black and oil slick colored nail polish and a silver paint pin made it look a little better. After cutting up a few belts I temperately attached everything with super glue and then started trying to sew it, using a big needle and waxed thread. I had to stop before it was finished because my household is asleep and I feel an awl and mallet are needed to finish. Hopefully I can finish this tomorrow before switching back over to the gin fairy. Will I ever get back to working on Negasonic? Or is that one just not going to happen?